An all natural food colouring for St. Patrick’s Day (or just because you want to get in more greens!) this spinach cake with chocolate coconut cream frosting is super moist and decadent. The photos and recipe for this spinach cake with chocolate coconut cream frosting has been updated as of April 17th, 2016! My best friend has worked hard the past few years to get into shape and I in no way wanted to sabotage her! You may remember my chocolate zucchini cake that I made her the previous year. I wanted to stay healthy, but not overly so where we had a, well, unique tasting dessert. She still indulges, like everyone should, and I plan to make her a super unhealthy cake just for fun! However, for her birthday this year I decided to try out the spinach cake I saw on Pinterest. I was a bit skeptical being that the cake was made up with spinach. I love spinach, but in dessert?! I must say though, this cake was super moist and so flavourful, I bet no one would guess the secret ingredient was your friendly green! Now, like many of my cakes, I did have some mishaps with this spinach cake. I wanted a healthy and unique icing to go with the cake. I know many have tried to whip coconut milk to no avail, but I had a can of coconut cream on hand and thought would work perfectly. And it did, to some extent. The problem came when assembling the spinach cake. I decided to do a layer cake instead of baking the cake on a sheet pan. Sigh, the regrets! Maybe my cake was not cool enough, or maybe just the weight of the layers was enough to turn my icing into a soggy mess. I was soooo upset when my cake started leaking. Arg, I was rushing, I had to be out the door at a certain time and this cake was falling apart! I got some pics in and gave it a taste. It was so good, I did not want to waste it. So, being the amazing friend I am, I pre-cut the cake for her and handed it over in a Tupperware container. Hey! In the end she loved it and I promised her another cake, so all ended well. So my advice would be to make this cake in sheet form, and top it with this frosting. If you look in the photos, the chocolate coconut cream frosting held up perfectly on top of the cake, just not between the layers. UPDATE: I made this cake again with great success! Make sure you cake is cooled COMPLETELY! No ands, ifs, or buts. As soon as you ice the cake I suggest placing it into the refrigerator to hold up. The sheet idea will still work fine if you are not into layered-cakes. I will have to play around some more (I really don’t know if I cooled my cake completely, but it still shouldn’t have been too much of a problem.) The chocolate coconut cream frosting was soooo good, I had to keep the bowl away from my 3.5 year old! If this healthy icing isn’t your thing, any type will do! This cake may sound and look strange, but the flavours work perfectly together! Just remember to allow your cake to cool completely before assembling. Puree spinach in food processor until really, really smooth. It may take a couple of minutes. In the bowl of your stand mixer combine the sugars, lemon zest, lemon juice, and coconut oil. Beat for 5 minutes. Add in one egg at a time, mixing well between each. Stir in vanilla, puree, and applesauce. Sift together the flours, baking powder, salt, ginger, and cinnamon. Add to wet ingredients and stir until just combined. Stir in toasted coconut. Preheat oven to 350F. Grease two 6-inch round pans (or one 9x13 inch pan.) Pour the batter evenly into the pans. Bake for about 35-40 minutes, or until toothpick comes out clean. Cool in pans for 10 minutes before finishing on cooling racks. Scoop out all the thick coconut cream from the pan, discarding the very liquidity stuff at the bottom of the can. Using a hand mixer, whip up the coconut cream for a minute or two. Add the maple syrup and cocoa powder. Whip until combined and stiff peaks form. Taste and adjust sweetness accordingly. Assemble cake as you see fit! I topped mine with toasted coconut chips. Don’t let my picture detour you! Even the best of food bloggers hit obstacles along the way (just some more than others!) 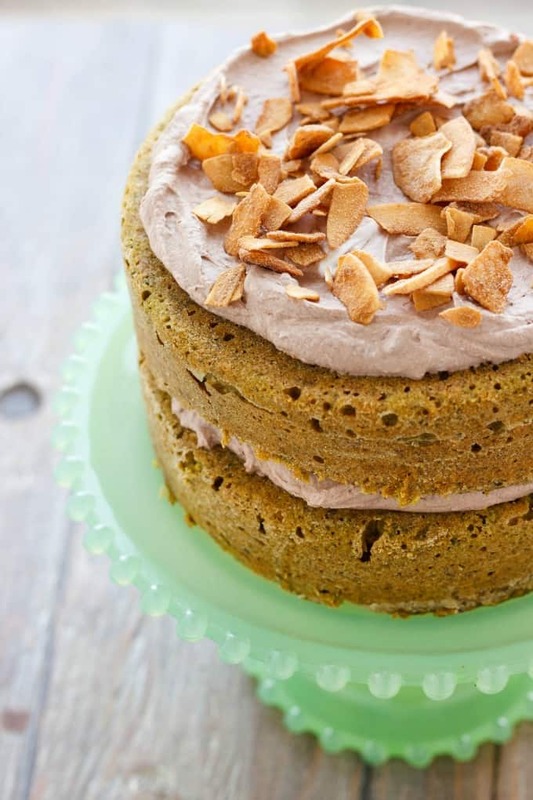 The spinach cake is to die for, and if you are not looking for a crazy healthy cake, by all means use your favourite frosting recipe on this cake. I learned my lesson and will make sure to only make this in a standard 9×13 inch pan! On the last note, this recipe can easily be made vegan by subbing in an egg alternative. I have not tried flax-eggs, but I am for sure going to give these a shot in cupcake form! What a creative cake! Your friend is pretty lucky! 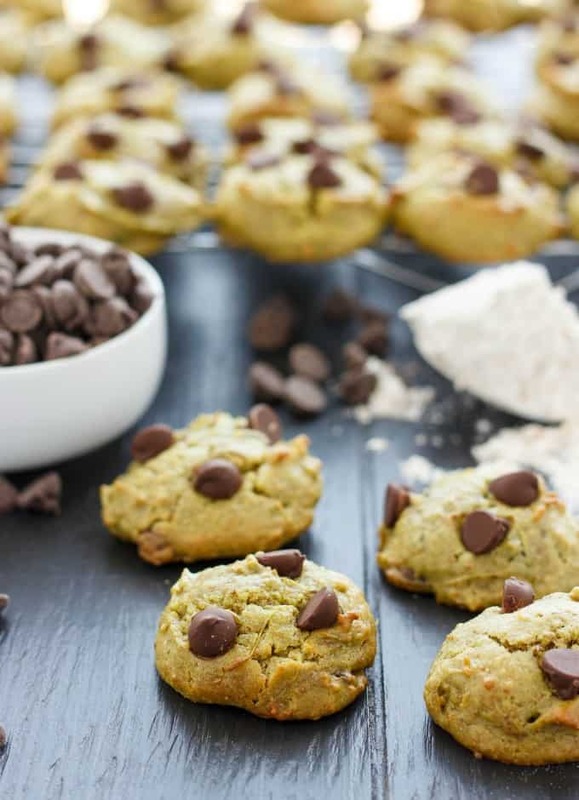 I never knew you could eat spinach for dessert, but you've convinced me! What a unique idea! I had never thought of putting spinach in a cake before! A sneaky way for kids to get their nutrients! Spinach cake!? Stop it! This is so weird and clever and brilliant. I want to try it! Haha, don't worry, no spinach taste and the cake is super moist!